This Sunday, June 30, you are invited to join Arlington house in celebration of the 182nd wedding anniversary of Robert E Lee and Mary Custis. From 11 am to 3 pm there will be period music and dancing, spinning and lace making demonstrations, and of course, tours of the historic mansion. We hope you will be there! June 9th at 8 am and 7 pm to American History TV on C-SPAN3. For weeks, Arlington House has been competing for Facebook likes, Tweets, FourSquare check-ins and Instagram tags. The result s of the Partners In Preservation Grant Contest supported by American Express were announced on May 13th, at Decatur House, a historic property in its own right. Monday turned out to be a h appy day for Arlington Ho use. Arlington House was awarded a $20,000 grant for the high percentage of votes that came from Instagram. In addition, the House as well as 11 other entrants was awarded $5,000 in unrestricted grant funds. The grant funds will be used to restore the South Wing Conservatory built by the Lee's and used by the Lee's to house tender plants in pots. Robert E Lee called it a "conservatory" and Mrs. Lee called it her greenhouse. Joined by National Park Service officials and U.S. Representative Jim Moran (D, 8th) Arlington House celebrated 6 years of restoration with a formal re-opening on 24 April, 2013. Save Historic Arlington House, Inc. (SHAH) continued this celebration with an Open House on May 4-5, 2013. This Open House was designed specifically to raise community awareness regarding a grant program funded by the American Express Corporation. Arlington House was one of the 24 finalists competing for one million dollars in grant funding. Social Media was a key component to the program with each historical site competing for votes. The site with the most votes will be the popular vote winner and receive complete funding for their restoration project. Our Open House weekend featured a General Lee reenactor who walked the mansion grounds discussing the history of Arlington House and why it was so important to vote for the House. Literally hundreds of school groups were enamored with the General and listened intently to his history lesson and the importance of voting. Equally exciting were our face painters that were providing free face painting over the weekend. The face painters were very busy with painting the faces of both young and old while explaining the importance of voting for the House. Volunteers were out in force during the weekend, all dressed in period costumes. Like the General, all were walking the grounds discussing the grant program and our specific project that needs funding. 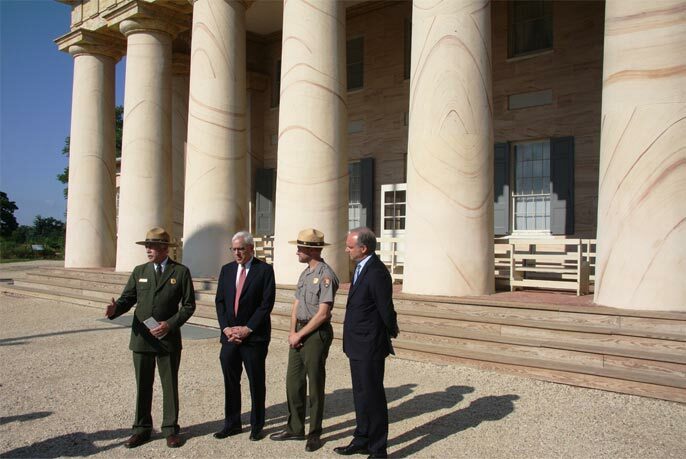 Inside Arlington House, the Park Rangers were giving historical tours of the mansion. The mansion’s furnishings and tens of thousands of artifacts are back in their places showing the mansion as it was in the early 1860’s. The Open House welcomed 4,600 visitors and SHAH considers that a great success!!! TO SAVE HISTORIC ARLINGTON HOUSE, INC.
A novelty replica of Arlington House has replaced the plain Plexiglas donation box which was previously found toward the exit of the main house exhibit. Visitors now have the opportunity to place their donations into a detailed novelty replica of the house through a caricature chimney. Money travels down through the house, and into a transparent reservoir. Broadway Scenic Designer, Anna Louizos along with Virginia native, Hilary Noxon, designed the box with the idea of giving visitors a sense of connection between their donations and the Robert E. Lee Memorial. The beautiful and artfully crafted replica is a welcome addition to the recently restored interior exhibit. The trustees of Save Historic Arlington House are deeply grateful to Anna Louizos Design Studio for its generous gift of time and talent in our behalf.